I’m fascinated with urban greening projects, not just creating municipal parks, but also the concept of groups of people coming together to plant trees and other greenery throughout city streets. One such organization that does an amazing job in my town, San Francisco, is the non-profit Friends of the Urban Forest. There are many such organizations all over the country, some that plant trees anywhere in a city, others that focus on helping disadvantaged neighborhoods by transforming blight into greenery or community gardens. Aside from the aesthetic value of turning sun-drenched concrete sidewalks into green canopies there are numerous benefits to the environment. 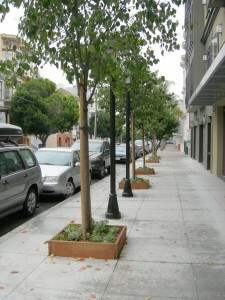 There’s a great deal of research on the subject of urban planting projects and the resulting benefits. Such projects help the environment by decreasing air pollutants, lower municipality expenses by absorbing water runoff, and affect resident’s energy usage by moderating temperatures. An example is a comprehensive research study conducted at the Pacific Southwest Research Station of the US Forest Service. But aside from the obvious ecological benefits, what’s in it for residents? Turns out that urban greening projects offer one of the most compelling benefits for a homeowner – increased property values. In his study Geoffrey Donovan of the USDA Forest Service demonstrates how planting trees at the entrance of a home actually adds value to the sale price of properties in Portland, OR. The average increase in a Portland home sale price due to planting curbside trees is $8,870, or 3% of the property value. In a similar study about going rates for rental units Donovan also calculates the increase in rents at about 6% for units with curbside trees. While one cannot expect Portland’s numbers to be indicative of other cities, it’s extremely likely that trees increase property prices and rents in any metro area. By how much may be an open question, but my hypothesis is that cities with historically high property values (such as San Francisco), are likely to see increases in properties with curbside vegetation at potentially higher levels than Portland’s average of $8,870. So why not take the initiative to add such value to your property? Take advantage of your city’s greening programs or of those of an urban greening non-profit organization, and get your street greener for practically free. On a side note, check out the CityNature blog for examples of metro areas around the world that have successfully improved neighborhoods with greening initiatives. Donovan GH, Butry DT. 2010. Trees in the city: valuing street trees in Portland, Oregon. Landscape and Urban Planning 94: 77-83. Donovan GH, Butry DT. 2011. The effect of urban trees on the rental price of single-family homes in Portland, Oregon. Urban Forestry & Urban Greening 10(3): 163-168. Flipping houses seemed to have been the trend in the glory days of real estate (aka the real estate bubble) but I dragged my feet too much and missed that golden opportunity. You see, San Francisco house flipping in 2011 is just not feasible. Well, at least not for properties that most people can afford. There are some opportunities which I will discuss here too though. With water on three sides, San Francisco has nowhere to grow, determined homebuyers must be willing to pay a premium for their piece of the city. NOT! Just like anybody else around the country, San Franciscans, new and established, know a deal when they see one, and don’t spend money just to get a place. In my recent research to find a place to flip, I learned that the market does not support just any flip. Low-medium end properties (that in San Francisco are sadly pretty much defined as anything below $1.5 million) attract people who are looking to get into a property at a reasonable price and improve it later. In other words, property buyers are looking for places with “good bones” into which they can put sweat-equity over time and make it the place they really want. These buyers aren’t looking to pay high premiums for remodeled properties, because they understand that it means that their money will buy them a lesser property. For example, if you have $800 thousand to spend, would you get the nicest one-bedroom in town, or a decent two bed/two bath place in a good neighborhood that you can later trick out to your liking? This is how buyers think in San Francisco. 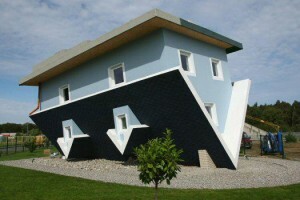 The lower the property cost, the less incentive there is to flip. In a city where a property under $400 thousand is almost unheard of, when something becomes available at a low price point (like a $300 thousand place in Hunters Point, a not-so-fashionable neighborhood), it attracts first time home buyers who until now could not afford anything in town. They are saving their pennies, and cannot pay a premium just to get a renovated place. They know they can do it on their own at a later point. Having said that, there is one market segment that does allow profitable flips. That’s the high-end segment, which is defined as places over $1.5 million, in a few affluent neighborhoods like Noe Valley, Russian Hill, Cole Valley, and a few others. There, home buyers who have the disposable income but not the time (or energy to get into a home renovation project) are willing to pay the premium to get a beautiful place that is completely move-in ready. They are willing to shell out the extra Dollars for a place that that matches their lifestyle, and that someone else has already painstakingly renovated. These aren’t your slap-a-coat-of-paint remodels, but thoughtful and expensive ones, and often times cost over $1 million in material and labor alone. The bottom line is that if you have the funds to buy a high-end property (at least $1.5 million) and still be left with enough funds for a comprehensive remodel (another $1 million), San Francisco may present flipping opportunities for you. But for the rest of us, San Francisco just isn’t the place to play house flippers, at least not for a while.